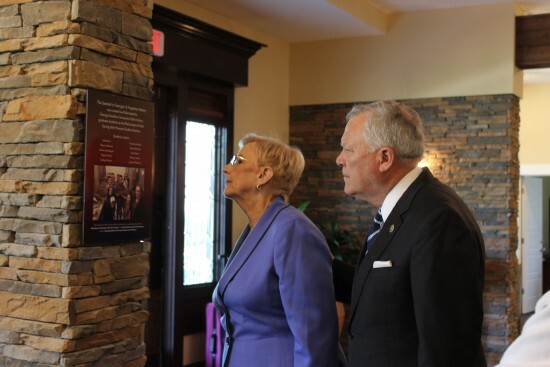 Georgia Governor Nathan Deal and First Lady Sandra Deal visited the Spanish in Georgia: A Forgotten History exhibit at the Museum on Main inside the Statesboro Convention and Visitors Bureau. Visiting the area to deliver a commencement address, the Governor and First Lady took in the new exhibit on Georgia’s 200-year history of Spanish exploration, settlement, missions, and interactions with Native Americans. The Museum on Main is a cooperative project between the Statesboro Convention and Visitors Bureau, the Georgia Southern University Museum, and the Department of History. Gov. Deal is Georgia’s 82nd governor and is serving in his second term after spending 17 years in the United States Congress.